Woodslawn Farm was settled in 1784 by Joseph and Lucy Purinton and has been in the Purin(g)ton family since that time. It is currently owned and operated by Robert and Joyce Purington. 1. Joseph and Lucy (Allen) Purinton [4-1] settled on the farm in Colrain in 1784 and were the first of the Pur(r)in(g)ton family to live in this town. 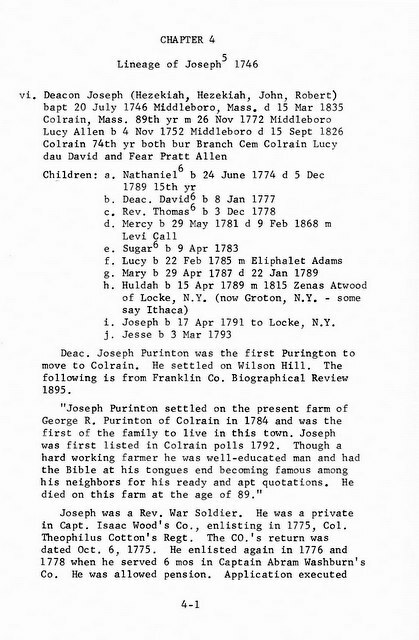 Joseph was born in 1746 in Middleboro, MA, the sixth of ten children [I-19] of Hezekiah and Mercy (Bates) Purinton, and died in 1835 in Colrain, MA. Joseph was a Revolutionary War soldier, enlisting in 1775. Lucy was born in 1752 in Middleboro, MA to David and Fear (Pratt) Allen and died in 1826 in Colrain, MA. 2. David and Lucy (Wilkerson) Purinton. 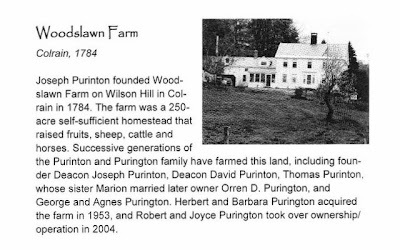 [4-3] David was born in 1777 in Middleboro, MA, the second of ten children [4-1] of Joseph and Lucy Purinton, and died in 1847 in Colrain, MA. Lucy was born in 1778 in Townsend, VT to Oliver and Alice (Rowson) Wilkerson, and died in 1828 in Colrain, MA. 3. Thomas and Eunice Lyman (Hawks) Purinton. [4-10] Thomas was born in 1825 in Colrain, MA, the eleventh of eleven [4-3] children of David and Lucy Purinton, and died in 1879 in Colrain, MA. Eunice was born in 1828 in Charlemont, MA to Oren and Sophia Hawks, and died in 1914 in Colrain, MA. 4.a. George R. and Hattie M. (Deane) Purinton. [4-10] George was born in 1853 in Colrain, MA, the third of 7 [4-10] children of Thomas and Eunice Purinton, and died in 1931 in Leyden, MA. Hattie was born about in 1855 in Gill, MA to Hiram W. and Melinda W. (Slate) Dean. 4.b. Orren Davenport and Marion Augusta (Purinton) Purington. [2-68] Orren was born in 1862 in Colrain, MA, the third of five children [2-65] of Samuel and Emily (Davenport) Purington, and died in 1931 in Providence, RI. Marion was born in 1867 in Colrain, MA, the sixth of seven children [4-11] of Thomas and Eunice Purinton, and died in 1906 in Providence, RI. Orren's great-grandfather was Joshua Purinton, older brother of Joseph Purinton - see #1 in this list. 5. George Richmond and Agnes Celinda (Call) Purington. [2-68] George was born in 1900 in Colrain, MA, the second of two children [2-68] of Orren and Marion Purington, and died in 1953 in Greenfield, MA. Agnes was born in 1903 in Colrain, MA to Byron and Alice (Mather) Call, and died in 1991 in Greenfield, MA. 6. Herbert George and Barbara Ella (Page) Purington. [2-69] Herbert was born in 1924 in Colrain, MA, the first of five children [2-68] of George and Agnes Purington, and died in 2016. Barbara was born in 1926 in Rowe, MA to Albert Kendrick and Cynthia Ada (Boyd) Page. 7. Robert Arthur and Joyce Marie (Smith) Purington. [2-69] Robert is the eighth of eleven children of Herbert and Barbara Purington. Joyce is the daughter of Richard R. and Viola E. (Belcher) Smith. [# - #] is the page number in Genealogy of Hezekiah Purrington (1715-1765) (of the fourth generation), copyright 1975, Pur(r)in(g)ton Family Association of U.S.A. Inc.
Pur(r)in(g)ton Family Association of U.S.A. Inc.
A biographical sketch of George R. Purinton (download the 3 page PDF file, 128 KB or read the article online) provides a brief look at the lives of George R., his father Thomas, his grandfather David, and his great-grandfather Joseph. The biographical sketch is from the book titled Biographical review : this volume contains biogaphical sketches of the leading citizens of Franklin County, Massachusetts (1895). The entire book may be viewed online.